I love your scarf. I love knitting with the loom, it's my fav. I am praying all is well with you and your son. I know you are half way, so pray your delivery is great. Have a great week. Great video tutorial! I'll definitely give it a try! Any idea what wieght of yarn you used? I use Red Heart for my plastic canvas crafts. Could I use that yarn for this? Great video! I'm wondering how much yarn was left when you had finished the scarf? Yes, you can! I carefully slide it off my arm onto something like a hairspray bottle. Great tutorial!!! I can't stop making them!! I made 3 in the past week lol! Wonderful and easy to follow tutorial! I'm a crocheter but I think this my be my segway into knitting. Thanks for the inspiration. Please visit my blog post about this lovely scarf at http://yarnjunkies.com/2013/10/30/arm-knitting-who-knew/ and to view my scarf. Thanks Again! I watched another video and I got so confused. After I saw your video I knew what I was doing. Thanks so much! I never knew there was such thing as arm knitting, after I saw your video I found scarves everywhere because I was knitting to much! thanks again! That's great to hear! I am glad you liked the video :) Happy knitting! About how much yarn does it take to make one? I want to make one for myself and one for my cousin as a Christmas gift and I'm wondering if I can make 2 from just 2 skeens of yarn or if I'll need to buy 4. I can get two medium length scarves out of 2 skein. But if you want two long length infinity scarves I would say buy 4 skeins. The tail goes around the forefinger, correct? Please reply. Thanks! the tail goes around the thumb when the casting on which is why we make it so long in the beginning because it gets shorter as you cast on. Once you start knitting it will remain the same length until the end. Audra... Love ur work!!!! Wanted to ask can i use two different colours of yarn? Yeah, I think that would look great! Hey Audra! 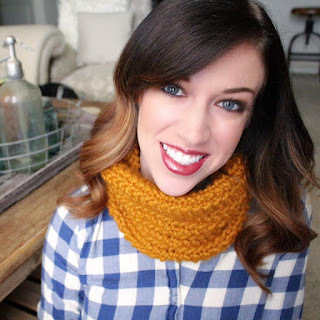 Great tutorial, I was looking up tips on knitting chunky scarves for beginners as I've never been able to knit well and I wanted something easy and cute for christmas gifts! Stumbled upon your tutorial and now I can't wait to make my own! Who knew you could knit with your arms?! not me anyway! I have a question though, for the infinity scarf do you 'sew' the ends together with both of the tails, or just one and cut the other one off? and also once you have 'sewn' along the length of the scarf with the tail, how do you finish it off? do you just tie a knot? yes, I use the tails to knit the ends of the scarf together. Then I just tie a knot once I am done and trim any excess. 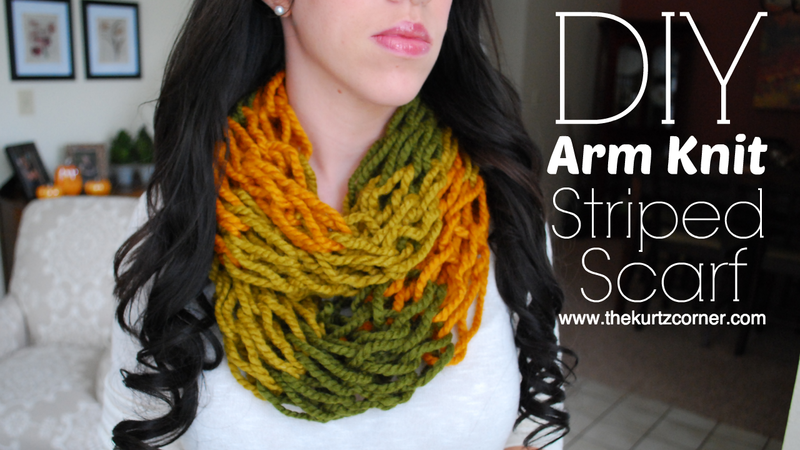 How many links do you recommend doing for an infinity scarve? P.S I am really excited to try this out as Christmas gifts! Im not sure where you went wrong, perhaps you wrapped the tail or working yarn around the wrong finger when casting on? I would try to cast on your 12 stitches again and pay close attention, making sure the tail is wrapping around your thumb when casting on. Hope that helps! Audra, I am having the same problem. I'm not really sure how you tighten your strands when you are making your second links (switching to your other arm). Also, when I got to the end where there slip knot is, I can't tighten it up. What am I doing wrong? And how are you tightening the links up? You tighten the stitches by holding the working yarn in the hand you are creating the stitches on once you have put your hand through the loop and with the other hand push the stitch up so that it tightens on the new arm. Is the tail supposed to get very short during casting? I think I am doing something wrong, but I can't figure out what. My stitches are very tight--can't keep them loose. Yes, the tail will get shorter as you cast on, which is why me make such a long one in the beginning. How short it gets depends on how long you make it initially and also on how many stitches you cast on. Try a 4 foot tail and cast on 12 stitches. That was the ideal length and stitches for mine. It's okay if they are on opposite sides, just weave one way and then the other, it will still work just fine! How do you add the second skein? You use both skeins the entire time, that it why you see two strands of yarn in my hand in the video :) Does that make sense? Audra...your tutorial was great...really easy to follow...thank you for posting. I'm halfway through my first one and can't wait to see it all finished!! Hi Audra- thanks for tutorial help. I've never knit in my life and I went nuts at a Michael's sale yesterday!!! Merry Christmas to everyone I know! But not I have a little problem. I can't quite figure out what I'm doing wrong. I cast the tail on my thumb and working yarn around pointer finger. Then- I've tried this two ways. One when I go through, the tail makes a knot but the the working yarn wraps around my wrist loose so I just dump it back off, but the underside doesn't look right. That's the only way I can figure to get two strings each into 12 casts. OR I get both working yarn and tail to knot in the same move, but I end up with 4 strings in each cast instead of 2. Can anyone on here help diagnose this from reading it? It sounds like you may be not going under and over the correct strings. Try watching the portion of the video in the beginning where I am shooting over my shoulder. Watched this video last night and I was hooked! Wanted to make one so bad I went to Michaels and bought yarn today! Only took me about 45 minutes! And this was my first time knitting anything. I mostly crochet amigurumi. it was a nice change of pace with almost instant satisfaction :D thanks for the awesome and very easy to follow tutorial! Hey Audra, love your video! I'm currently watching it and trying to knit my scarf but I'm having some trouble at the part when youve passed your entire scarf onto your opposite hand. I've tried it twice and booth times, the last stitch is so loose that I know I;ve done something wrong,. I was thinking maybe i tied my slip knot wrong? No matter how many times i pull my working yarn to try to tighten it it doesnt work out:/ HELP! Hey I was wondering how long (and how much yarn to use) to make the scarf if I want it to wrap around my neck twice. And what size would you recommend for a medium weight scarf (not chunky)? Thanks for the tutorial and any help would be great! When I cast on, my tail and my working yarn end up moving apart instead of together, so that when I finish casting on the tail is at the bottom and the working yarn is at the top. I kept going to try knitting but I can't seem to tighten the loops on my arm correctly (I can tighten it by moving my two arms apart).... it feels like I'm knitting backwards... help? I'm not sure that I know how to answer this question. Try watching the video again where I shoot over my shoulder for a closer look at where I place my hands and strings. Great video! You were very clear with your instruction. I can't wait to try this. You are an amazing teacher!!! I just made it and I'm so excited!!! Thank you so much!!! 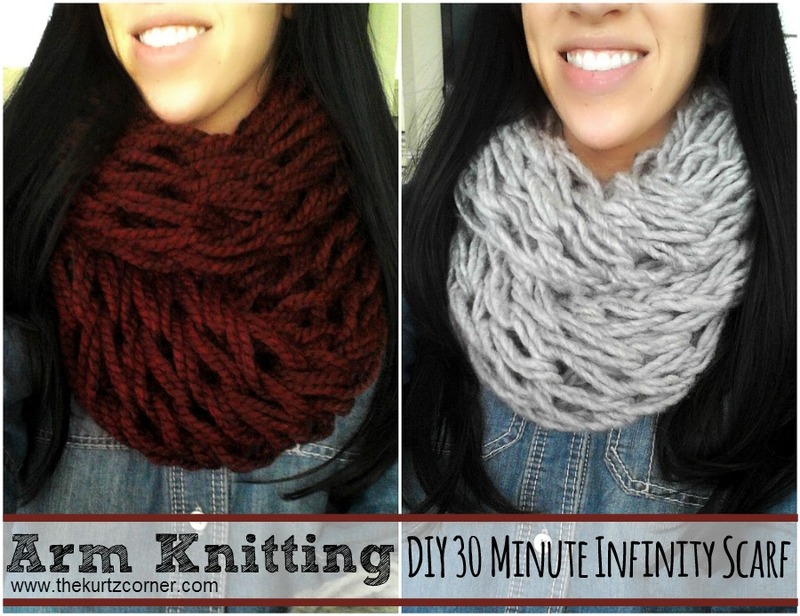 This video was very helpful, however I'm going to try it with a less bulky yarn next time and go shorter so that it is still an infinity scarf I just wont have to wrap it around my neck. love the scarf, one problem why is my last stitch as I finish a row so much wider? I can't seem to make them all the same, well really just that last stitch on each row. help please. these are Christmas presents. The last stitch is always the hardest to tighten, I don't think you're doing anything wrong. Just do your best to tighten it as much as possible before knitting the next row. When doing two different colors would we do it in the beginning with the knot wherr you tied both skeins together? You shouldn't be tying the skeins together? If you mean when you create the slip knot, then yes, that is when you combine them. I have been trying with some yarn I have lying around at home (not the right kind though), but I am trying to cast and I think I have it right, but when I pull through and tighten, one stitch has four strands compared to the first starting stitch that has two. Do you happen to know what it is I am doing wrong? It sounds like you grabbed two stitches (a total of 4 strands) instead of one stitch (a total of 2 strands) when going from one arm to the next. I am currently in the middle of my scarf and just realized that one my skeins had a length shorter than I need how should I add an other skein to it??? Try the Russian join. See YouTube for instructions. Audra, the medium scarf is 25 to 30 inches or 25 to 30 times? What is the minimum amount of yards you need to make a scarf like shown above? I bought a bunch of skeins and just realized they're all different lengths and wanted to make sure they were long enough before I start! I have made 3 since I found your video a few days ago. Love them! Every time I start to knit I'm fine until my very last cast on-my slip knot. It will not tighten like the rest. I'm left with a big loop of yarn. Any idea on what I'm doing wrong? i've had the same problem! does anyone know why/how to fix this? when i'm bringing my last knot over to my not-dominant hand it's just a big loop and won't tighten. me too! Can someone please answer this?? I have been on three different websites and no one EVER answers this questions! Audra, I stumbled across your video while looking for beginners knitting. I never got out my new needles. :-) I'm addicted! I made my first in about an hour and can't wait to go get more yarn :-). The best thing is that with the loose weave, it has a lot of forgiveness for imperfect/slightly inconsistent stitches. Have you done a blanket? Wondering what dimensions work best and what the finished size is? My husband and I just started knitting, and I found this video a week or so ago. I've made about 20 of these so far! Everyone I see LOVES them! I did alter one thing. I only make mine 6 stitches wide. I've actually even made a couple with sashay yarn and they look FABULOUS! But, those I only do 4 stitches wide (the yarn isn't long enough to do any wider). Gives me a great alternative to the usual ruffle scarf. You are a phenomenal communicator. I am impressed with your ability to explain and continue to knit. I anticipate making my own. Thanks for sharing your brilliance. Love the video, very clear instructions. Can hardly wait to try it with multiple yarns, 4 or more. diff. textures and colors. Thank you. I can't wait to try this!!! I'm not a knitter but I think I can do this!! The ONLY thing I know how to do is crochet the "frilly" scarves and some other craft items so if I can make these and add them to my collection of items I sell. THANK YOU!!! Just made one, turned out beautiful! It came out in garter stitch, is there a way to arm knit in stockinette stitch? Thank you for the tutorial! It was easy to follow. The only thing I can't seem to get down is that my sides seem less tight. Do you have any tips on the last stitch? For those who are having trouble getting theirs to work out, I suggest another trip to Michael's or JoAnne's or even Walmart to get their loopy yarn or cut-loop yarn that is made specially for crocheting over your hand----in 15 minutes! Yes! The inside of the package tells how to anchor the doubled yarn over your hand with a half-hitch knot, then form the chain by just looping the doubled yarn over your hand: each loop goes in front of the one already there. The back one then gets pulled over the new one, dropping it off your fingers, where it adds to the chain! Just give the chain a gentle tug downward then loop your hand again for the next "stitch" ! Had my teen class, then later all my siblings---brother, too--- doing it after Thanksgiving dinner! This yarn costs $4.50-$5.99, but can be purchased with their coupons cheaper, of course. Only one skein needed. Knot the end as you like to secure it to previous stitches or join to the other end as an infinity scarf. Audra your tutorial was detailed and helpful but I cannot see during the casting on stage where my hand is supposed to go after I go through the thumb. Any chance I could get a little help on the next part? I know am a little late to the arm knitting party since I just found this on New Year's Day, but WOW! I've been churning these out and wishing that I started before Christmas because EVERYONE would have gotten a chunky infinity scarf from me! Your tutorial is awesome - I was so appreciative of the other camera angle behind you because I am not a knitter and was having trouble with the casting on. You're the best - so glad I found you! Please tell the yardage of the skeins you used & about how much was left. You are a very good teacher but this is the most important info lol & how long would this infinity scarf be if you didn't join it together? I want to make a normal scarf about 4.5 ft long & without any yardage info it's difficult to figure out. I have 2 skeins of 64yrds each. I want to know if I can double them like you did & maybe only cast on 6 or so..or if I should only use one & join them if the first runs out.. Thanks so much! I have made my first one. I would love to share a photo. I'm not sure how to wrap it. I don't know what I'm doing wrong but my ends (the cast on row and the bind off row) seem to be so tight together that it looks pinched when I put them together and the rest of the area where it is knight is open like it is supposed to be. Any ideas? j'ai fais le mien selon vos instruction et c'est super ! Votre blog est vraiment intéressant ! Beautiful......ingenious.....though im from Singapore where it's just sun or rain, or both, im intrigued by this style of knitting. Gonna experiment n maybe I can send a couple to my relos who are in colder climatic regions. Tq for the super easy to follow tutorial. Wow, thank you so much for this tutorial, I absolutely LOVE the Infinity Scarf, it looks AMAZING! I am definitely going to try this myself, and even attempt to give it as a gift to someone, thank you heaps! Beautiful blog, love it! This tutorial is amazing! And just in time for my mums birthday next week. (as I'm a student its cheap and cheerful, perfect!) I was just wondering how you join the two skeins? Is it half way through? How do they go together? It only shows you using one skein in the video. Hi Audra - love this post! I'm almost done with my first scarf. Have you tried washing yours yet? If so, did it hold up? How much yarn is needed to make one for a toddler? How many links to fit a child? It sounds like you might not be grabbing the right amount of yarn pieces each time you knit or you're not dropping the right strands as you knit. I have now literally been doing this for 3 days straight! I have worked at trying to make this scarf for more than 25 hours. It simply does not work for. I get the first stitches done on my right arm, which look great, then I get the links done to the last stitch, and the last stitch looks bad... and hangs down really farr!!!!! Im getting angry to be honest. I continue the pattern and try to make the second row of links and what happens is I have the working yarn now in my right hand with one very loose stitch that doesnt tighten when i pull the working yarn.. and then if i keep the working yarn in my right hand- between that yarn and the tail that is hanging towards the floor theyre are two sets of yarn that the knot is trying to move up, but I still cant get it to tighten! I just need some help, I dont know how or if im grabbing or dropping the wrong strings Im doing everything it seems that you are in the video... can ANYONE help me out!!! I've made two scarves with the help of your video :) the first one I made is too big and the second one is too small. Can you altar the size after you finished it? Love the video!!! You make it look so easy, can't wait to try it!!! Great Christmas gift idea. Hi Audra! Great video. But, it turns out my scarf ends are uneven when I finished. I started with six stitches, but the end of it ends up being way bigger than the beginning end. Any idea of what I am doing wrong? Thank you! It sounds like you aren't dropping your stitches as you're knitting or when you are casting off. I need help. Im confused about adding another ball of yarn to lengthen my scarf. The ends of my working yarn arent the same length and dont match up. Also, I saw on another youtube video posted by another user about adding. She used one ball of yarn to add and tie. My working yarn has 2 stands. Should I add one ball to each end or tie both ends one strand. When making the 12 stitches, is the tail supposed to decrease in length? I did it!!! I made one! Thanks for the awesome instructions!!! :) Can't wait to make more for christmas gifts! I have made two scarfs after watching you video and I love them! Just noticing that my links are really loose and it doesn't look as good as yours. Am I not tightening up on my arm well enough or am I doing something else wrong? I am using the exact same yarn you use. Please help :) Thank you! Please help! I don't understand where to put my working yarn when I'm finished or where to put my tail. Does it matter that every single time I go to make the scarf an infinity scarf that the tails on either end of the scarf are on the same side? Like when I lay the scarf flat to match up my ends the tails are on the same side of the scarf so when weaving the tails in, I have to use all the tail. I've made this scarf twice and it always ends up that way. I also find the weaving in part to be the most difficult part. Any advice?